This is an evolving collection of poems which I think kids will enjoy. May it be that our kids don’t just learn how to read and write, but also the marvellous possibilities that words can bring. Some months ago an older woman whom I greatly respect introduced me to the poetry of John O’Donohue. His poems, for me, occupy that rare space between humanity and the divine, a sort of linguistic thin place. Today I returned to this poem, felt my breathing slow, a calm return. Perhaps it might bless you too. The ride you never valued has gone out. My friend PS over at Escapades is not only a superb running shoe consultant, she also unearths some of the most fabulous Internet gems. Like this one, that gives you the perfect cover for stealth consumption of literary classics at the office. As a lover of literature, I thought this was one of the cleverest things I’ve seen on the web in a long while! 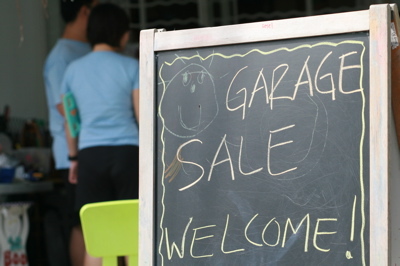 Our 6th multi-family charity garage sale flew by on the blessed wings of gorgeous weather, generous donors, faithful helpers and bargain hunters. We had items of every category from 27 (!!) families, and a steady stream of customers, especially on the first day. And I am delighted to share that we raised almost $2,500 for missions work in the Philippines! As a student, I used to love the poetry of Gerard Manley Hopkins. It wasn’t intellectual like TS Eliot, nor contemplative like Wordsworth. It wasn’t trying to be anything except a joyful exploration of how sound and language could represent the world around us. At his best, Hopkins’ poetry was worship. My favourites are The Windhover and Pied Beauty.